Enthusiastic beer drinkers can usually be found drinking a variety of brews. The craft beer industry has become quite popular throughout the U.S., although some regions are better known for it than others; and it has also started to gain ground worldwide. In Moorhead, one brewery rises above the rest. Junkyard Brewery is my go-to place in the area for great craft beer on tap. Granted, the small city of just over 40,000 only has one brewery, but its neighboring border city of Fargo, North Dakota has four other breweries to compete with. It may not be a big market yet, but it is growing in the area. The location, atmosphere, service, beer variety and pricing, and food availability always seems to keep me coming back for more and recommending this brewery over others in the area. North Moorhead can be a tough location for any business, as it is a little bit remote at times. That doesn’t seem to be a setback for Junkyard, though. On the contrary, I think it may be of some help. There is a very small lot next door that belongs to other businesses, but Junkyard customers can use it after business hours. For more parking, there is an empty lot across the street that people use, along with a few parking spaces on the street. Junkyard is situated on a fairly quiet street, although there are train tracks across the street that are used. Residents from all over the Fargo-Moorhead area enjoy hanging out at Junkyard, so the location doesn’t seem to be a hindrance. Great atmosphere should not be missed when it comes to keeping a brewery running. Junkyard has several “cool factors” that their repeat customers enjoy. The brewery is set up “garage style” with a garage door that is opened up on nice days, which allows for seating for upwards of 80 more people. Unfortunately, that means fewer people fit inside the building during the long, cold Fargo-Moorhead winters. Live music every night attracts people of all ages, mostly acoustic and folk acts. 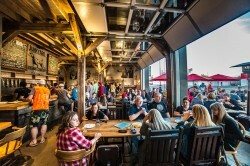 Junkyard is family-friendly with non-alcoholic beverages for those under 21, and dog-friendly when the garage doors are open. Inside, the walls are decorated with logos of some of the different beers. These are designed and drawn by one of the owners, Aaron, who spends a lot of time at his brewery. The staff is very friendly and knowledgeable, while also keeping up with the busy crowds. All of these elements come together nicely to give the brewery a fun, laid-back atmosphere that has customers returning. The staff at Junkyard gives good service through friendliness, knowledge, fun, and professionalism. The employees are good-natured, sociable, and easy to get along with. They are very knowledgeable and can answer questions about all their different beers. They are fun but also professional, stepping out from the bar every once in awhile to make sure everyone is getting served. Among the many kinds of beer are dark, malty, hoppy, light, sour, and everything in between. They tend to switch their taps for new beers every couple of weeks, which keeps things exciting. Beer is served by the pint or the half pint, and they give you samples if you can’t make up your mind by looking at the menu. A half pint will cost $3 or $4, while pints can be between $4-7 with most being $6. This brewery is the place to be for bad decision makers, or for those who don’t know what kind of beer they like, because there’s often something new to try. On Sundays, people can get a growler filled, which is typically 64 fluid ounces of beer! For the under 21 crowd, they also serve several non-alcoholic beverages including soda, coffee, and ginger beer. Food trucks are the main source of food for Junkyard patrons. Pico, Potato Bros., and Dogfather are the three main food trucks that take turns being parked at the brewery. Pico has delicious tacos, chips and salsa/queso, and quesadillas. Potato Bros sells comfort with locally sourced food, including huge tator tots and a tasty hotdish. The Dogfather truck is known for Chicago-style hot dogs, sausages, polish, and beef sandwiches. Junkyard does sell little bags of Dot’s Pretzels, which are actually local to North Dakota, and there is a popcorn machine that anyone can use for a snack. And if none of those options seems to satisfy you, you are allowed to order or bring your own food. You won’t go hungry at Junkyard unless you just don’t eat! It’s not a big market here yet, but I think they will have some more competition in the years to come. Junkyard will also grow in size themselves because of competition and also, I think, because of popularity. As long as they keep the location, atmosphere, service, beer variety and pricing, and food availability that they already have (well, maybe more food in-house if they can build a kitchen), I guarantee people will come and then come back for more.